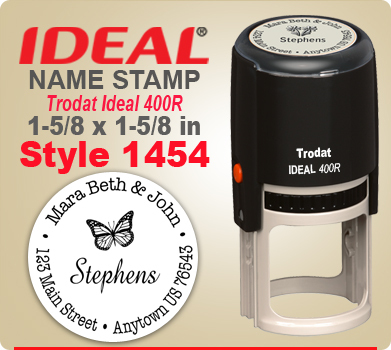 Select from 99 specially prepared logo clip art images for your Ideal 400R Name Rubber Stamper. These images make great impressions on Self Ink Ideal Rubber Stamps. Click the link. Select a logo. Enter the number of the logo into the space provided. Name Stamps are 1.5 by 1.5 round images. Name Stamps have many creative possibilities. Your finished Rubber Ideal 400R Ink Stamp Name Stamp will look just like the example shown. If the order is entered by 4 PM Central Standard Time your Rubber Stamper will ship the following day.